Swimming and yoga have more in common than you would think at first glance, and they can greatly benefit each other. Yoga can ease and counterbalance the swimming practice, and bring some sweet release, especially into the shoulders and upper back. Yoga offers flexibility, it improves the range of motion and helps to build muscle strength. The breath awareness from yoga will translate well into swimming, since the movements are synchronized with the breath in both yoga and swimming. The focus of a yoga practice for swimmers is on the shoulders, shoulder blades, opening the hips, and strengthening the ankles. In swimming there is a lot of pressure on the shoulders and the shoulder blades, but also on the hips and feet. As in yoga, the whole body is used in the water too; from the fingertips to the toes. Open shoulders will help with strokes, open hips will benefit the kicks while the hands and feet are fine-tuning the larger movements of the body. Downward Dog stretches the shoulders, chest and hamstrings, but also strengthens the upper body and calms the mind. To start, come to your hands and knees. Place your hands firmly to the ground, tuck your toes under and rise to Down Dog. Slowly stretch the back and the legs first. Draw the shoulder blades towards the spine and actively try to lower them, rotating your upper arms outwards. Focus on having your spine straight and aim your tailbone towards the sky. Bend your knees if you need to in order to keep length in the spine. Stay for 5 breaths. The Upward Facing Dog opens the shoulders and chest while stretching the abdomen and the front of the body. Begin by laying on your stomach and place your hands next to your shoulders. Pressing your hands and the tops of the feet to the ground, start lifting yourself up with an inhale so that your upper body and thighs come off the floor. Keep the arms rotating outwards, and the thighs inwards. Be mindful that your shoulders are not tensed and that you are not hanging on the shoulders. As in Down Dog, keep your shoulder blades close to your spine, and draw them downwards so that you don't hang on your shoulders. Keep your neck neutral. Stay for 2 to 4 breaths. This pose is a great, gentle hip opening pose. Hip opening poses are beneficial for swimmers, since swimming tends to tighten the hips. Start in Dandasana, and start to open the hips, bringing the soles of the feet together. Bring the feet as close to the hips as feels comfortable. If your knees are much higher than your hips, or your lower back is rounding, sit on a block to elevate the hips. Don't force your knees down, but try to open up from the hips. Lean forward if you want more of a stretch to the hips. Keep your hands under the feet or resting on the floor, and breathe deeply. Stay for 2 to 3 minutes. Bow Pose opens and stretches the front of the body, while strengthening the back muscles. Start by lying on your stomach, and bring your hands next to your body. Bring the heels close to your buttocks and take hold of your ankles. Keep your feet hip-width apart. 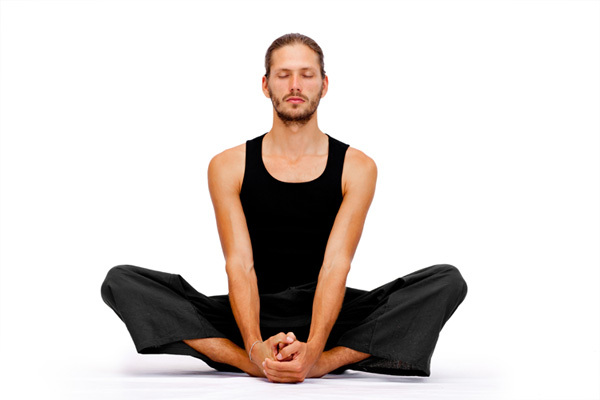 As you inhale, press into your hands with your feet, lift up your legs and chest, arching your back. Remember to keep the shoulder blades close to the spine. Stay for 2 to 4 breaths, and slowly come down. Repeat 2 to 3 times if it feels comfortable. You can also do one side at a time, the Half Bow, if the full versions seems too much. To strengthen the ankles, knees and the feet, come to the Hero Pose. For most people this is more comfortable if done sitting on a block. Sit on your knees, and bring your feet wider than your hips. Place the block under your buttocks, between your legs. Have the tops of your feet pressing against the floor, and turn your thighs turning inwards. Your big toes are close to your hips. Stay for 1 to 2 minutes, close your eyes, and breathe deeply. Swimming and yoga both aim for having the senses drawn more towards the inside. When we work with the breath and focus on movement of the body, we can surrender into the present moment. Both yoga and swimming also promote relaxation, inner awareness and being present with the body without high impact movement. Enjoy both activities and let them benefit from each other.